Memphis was the capital city of ancient Egypt during the Old Kingdom and has had several names during history. The original name given to this city was Inebu-Hedju (the White Walls), a reference to the white walls surrounding it. At the beginning of the New Kingdom the city became known as Men-Nefer (Enduring and Beautiful) which became Menfe in Coptic. The name Memphis is the Greek corruption of this name, which was originally the name of the pyramid of Pepi 1, located west of the city. Memphis was reputedly founded by the first pharaoh Narmer / Menes, soon after the unification of Upper and Lower Egypt. Memphis was believed to be under protection of the god Ptah, the God of creation and craftsmen. He was worshiped with his wife, the goddess Sekhmet and their son, the god Nefertum. Ptah’s great temple, Hut-ka-Ptah (Enclosure of the ka of Ptah) was one of the most prominent structures in the city. Because of the many necropolises associated with Memphis, many Egyptologists believe that Memphis once was an extremely large city. The city was filled during its glory days with palaces, gardens and temples. Memphis occupied a strategic position at the mouth of the Nile delta. It was home to feverish activity and its principal port, Peru-nefer, harboured a high density of workshops, factories and warehouses that distributed food and merchandise throughout the ancient kingdom. During its golden age, Memphis thrived as a regional centre for commerce, trade, and religion. The end of the Old Kingdom by no means meant the end of Memphis. It remained the political and administrative centre of Egypt. The necropolis of Saqqara and Dashur, near Memphis, are associated with Memphis as favourite burial places for pharaohs of the Old Kingdom. Nowadays, the ruins of Memphis, located about 20 km south from Cairo, just offer fragmented evidence of its magnificent past. The Temple of Ptah, the palace of Apries, a large necropolis and two huge statues of Ramses 2 are among the most important monuments found at the Open Air site. One statue of Ramses carved in limestone is about 10 m long, even though it has no feet. 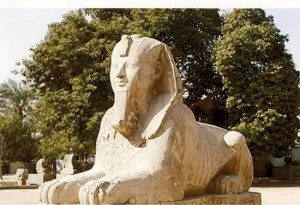 And there is a beautiful Sphinx, carved from a single but giant piece of alabaster, weighting more than 80 tons. It once stood outside the massive Temple of Ptah. There are also remains of granite statues of Ramses 2 and granite coffins and commemorative tablets from later periods.